The Department of Medicine is a clinical academic department within Dalhousie Medical School in Halifax, Nova Scotia. Our mission is to improve health through education, research and the provision of clinical care. 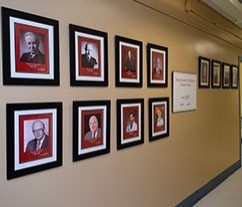 Our 180 faculty members are award-winning teachers, researchers and clinicians who serve the complex medical needs of adults in Halifax and the Maritime region. Nova Scotia Health Authority and family physicians across the region are our partners in providing exemplary care. We offer undergraduate education and residency training in internal medicine and 15 subspecialties. Our residency program in Halifax and in Saint John, New Brunswick trains the next generation of internists and subspecialists. Medical students from Dalhousie and schools across Canada can choose from more than 20 electives in each year of medical school to build on their knowledge of internal medicine. The department boasts a growing, collaborative research program. We have strengths in geriatric medicine, neurology, cardiology and infectious diseases. Our faculty members’ research efforts attract more than $11 million in funding annually. The department’s research infrastructure includes a research office, advisory research committee and funding awards for new and established investigators.